In 2012, archaeologists made an amazing find in a Spanish cave: the intact, 8,000-year-old skeleton of a man who lived in the area. Now they've sequenced his genome, and discovered quite a bit about life among hunter-gatherers in southern Europe. The La Braña man, as he's called, was buried with another person, and they were both surrounded by the teeth of the red deer. These were probably of symbolic importance to his people, who hunted the red deer as one of their main sources of meat — indeed, red deer tooth ornaments have been found in ancient human settlements throughout Europe. La Braña man also lived at a crucial transitional time for humanity, at the moment when agriculture was spreading throughout his home continent. Though people had been farming for centuries in the Middle East at this time, La Braña man was part of a group of hunter-gatherers who lived nomadically. Nevertheless, it's clear from his genome that he was descended from peoples in the middle east. Those peoples immigrated into Europe, spreading out in nomadic bands which traded with each other over vast distances and appear to have shared the same culture. 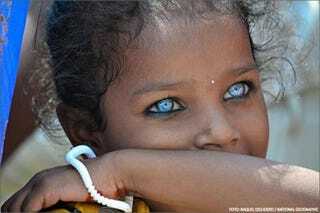 They also had some physical traits in common too, one of which was blue eyes and dark skin. One surprise is that the La Braña man had dark skin and blue eyes, a combination rarely seen in modern Europeans. Although today's southern Europeans tend to be somewhat darker than their northern counterparts, they are still relatively light-skinned compared with Africans, an adaptation often linked to the need to absorb more sunlight and so produce adequate amounts of vitamin D. That this feature of the La Braña skeleton might have been widely shared and not just a one-off is also suggested by recent findings, as yet unpublished but posted online in preliminary form, that other European hunter-gatherers also had dark skin and blue eyes. Though La Braña man was a nomad, his connection to farming groups nevertheless showed through in his genes. Scientists know that the sedentary living of agricultural life changed the human genome, by creating an environment where people were more likely to survive if they could ward off infectious diseases associated with high-density city life (obviously cities were smaller 8,000 years ago, but they were still dense). It seems that ability existed even in the people who had left the Middle East to roam the wilds of Europe. It's possible they had even suffered from diseases that began among their farming relatives, long before they met those relatives face-to-face. But the La Braña man did have some talents thought to have originated only with farming societies: His immune system was apparently capable of fighting off a number of diseases, such as tuberculosis, pneumonia, and malaria (which was endemic in southern Europe until modern times), which researchers had assumed were passed to humans from animals once cattle, sheep, and other species were domesticated. Out of 40 genes involved in immunity that the team looked at, 24 (60%) were similar to those of modern Europeans. "It appears that the first line of defense against pathogens was already there," says Wolfgang Haak, an ancient DNA researcher at the University of Adelaide in Australia. One possible explanation, [geneticist Carles] Lalueza-Fox adds, is that "epidemics affecting early farmers in the [Middle East] spread to continental Europe before they went themselves." That said, La Braña man was not yet able to digest starches and break down lactose very well. The genes that allow us to do that are also crucial mutations that helped people adapt to agricultural society in Europe. Another feature of the La Braña genome is more consistent with current thinking about how farming changed human biology, however. The genes involved in breaking down lactose (the key sugar in milk products) and starch (the key nutrient in domesticated plants) were in an "ancestral" form, the team reports, meaning that hunter-gatherers were not good at digesting these foods, which later became essential to farming societies. So it's likely that La Braña man was part of a transitional society where farmers and hunter-gatherers co-existed, and perhaps even shared the same cultural traditions.